﻿REB last added to this partial list on 8/28/2016. 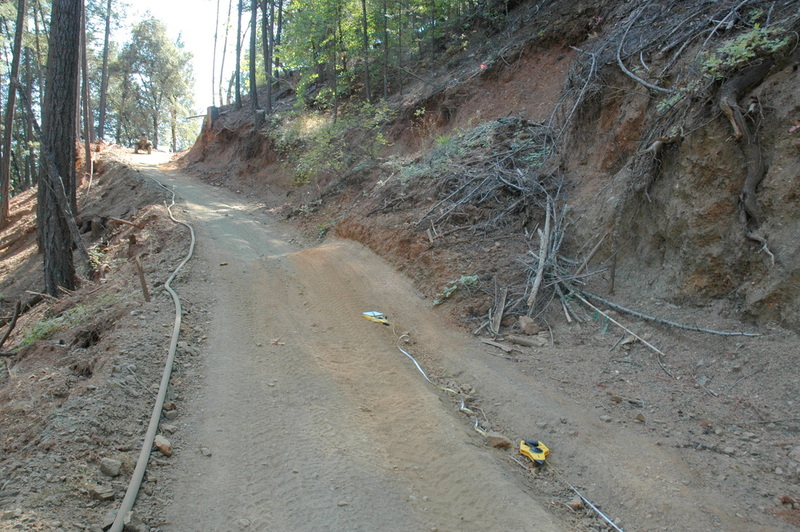 ...hired us to help him comply with a USFS / court-ordered requirement to properly rebuild a road he pioneered across his property near Weaverville, CA, without a permit. Here is a location where the bulldozer excavated too steep a cutbank, causing a failure of the hillslope above. The road also is insloped instead of outsloped, so water runs along the base of the cutbank causing erosion. The operator also pushed dirt over the outboard edge (he sidecasted it), so it is eroding and is unstable. Finally, no one did any preventative erosion-control work. ...needed assistance. Before there was a brand new Chevron station in McKinleyville, CA, there was this building and a lot of uncertainty. The distributor hired BGC to evaluate the soils conditions where tanks, pumps, lines, the sign, and a building addition would go. This arcuate strip of soil (augur cuttings) shows a marked changed in color with depth. The contractor graciously loaned BGC this powerful worker to help us hand augur down through the sticky clayey soils. 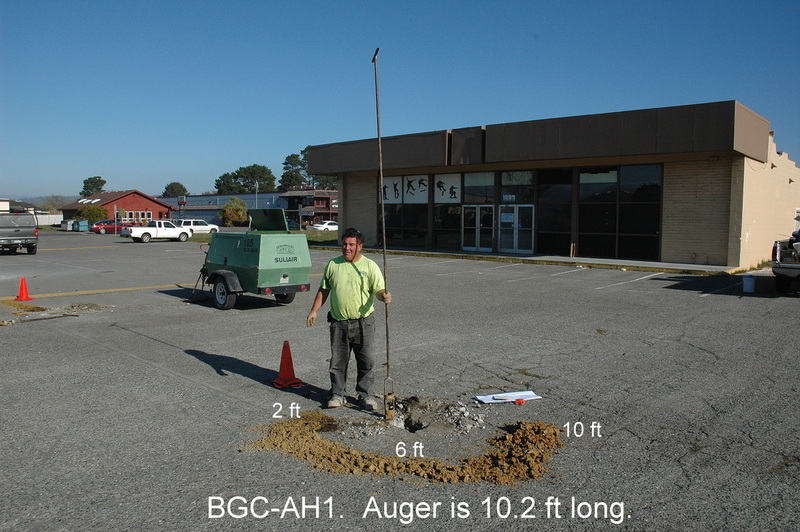 We did multiple augur boreholes and several test pits behind the building. 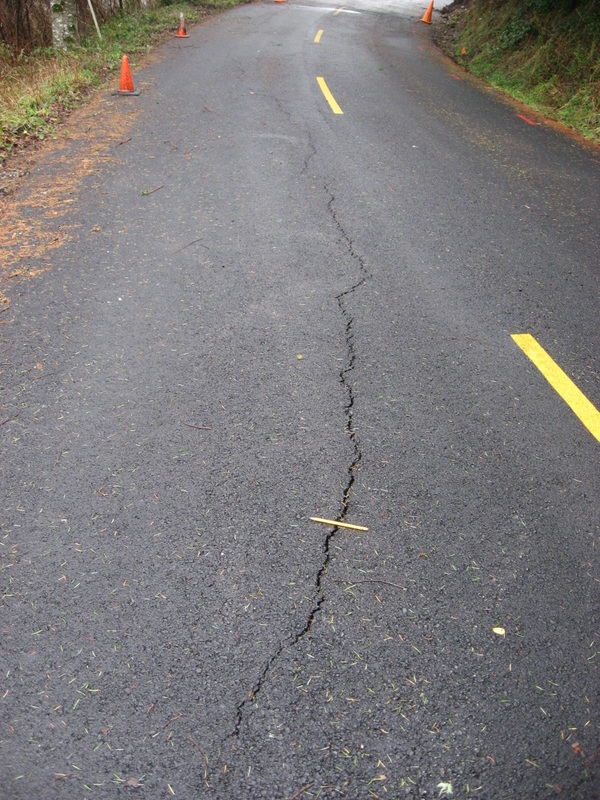 ...hired us to determine why an insured's new driveway in Crescent City, CA, was "alligator cracking" and failing. 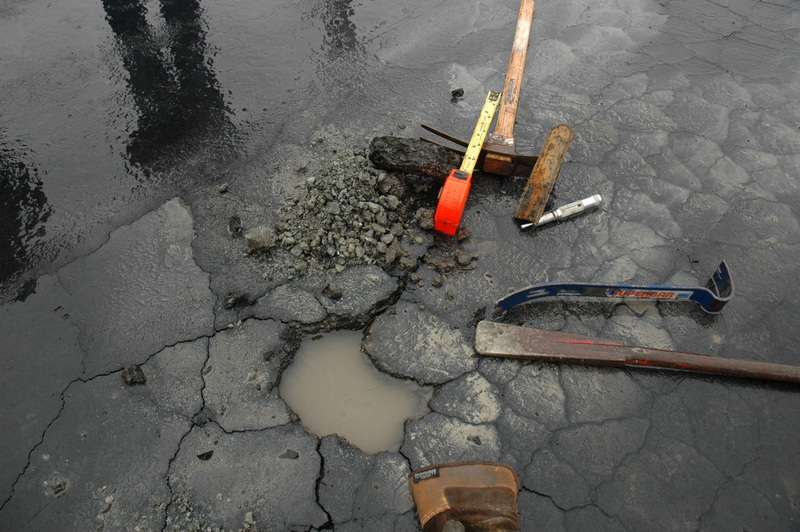 We measured the thickness of the asphalt and underlayment (bedding material) in several locations and determine what the soils conditions were below the bedding. The paving contractor came out while we worked to see our results and discuss the situation with us. ...hired us to inspect the excavations and provide recommendations after a backhoe operator digging foundation excavations encountered some problematic soils near the edge of the building pad and, worried, called the developer. The north end of Gold Beach, OR, the Rogue River, and its famous bridge are in the background. ...initially asked BGC to provide a risk assessment that pretty much said everything is OK. Unfortunately, it wasn't. 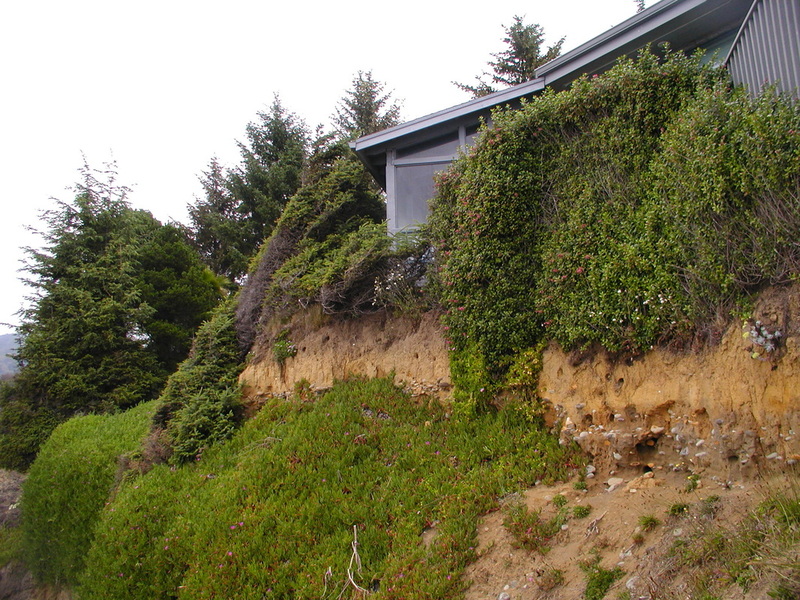 Parts of this Brookings, OR, home's perimeter foundation were inches to feet from the edge of a vertical soil bluff face. Instead, we completed a comprehensive evaluation of the foundation soils conditions and supported the engineering design of stabilization repairs including groups of helical soil anchors. Shortly after it was repaired the home sold. We took the following three photos at the same home. Here's a view of a part of the home. The corner of the foundation of a room with an exercise pool in it is inches away from the bluff top. This photo shows how we determined the footing embedment depth and characteristics of the bearing soil at locations around the home. Here is a hand-dug excavation with a hand-augur borehole in its bottom. The footing is resting on topsoil (an undesirable condition). 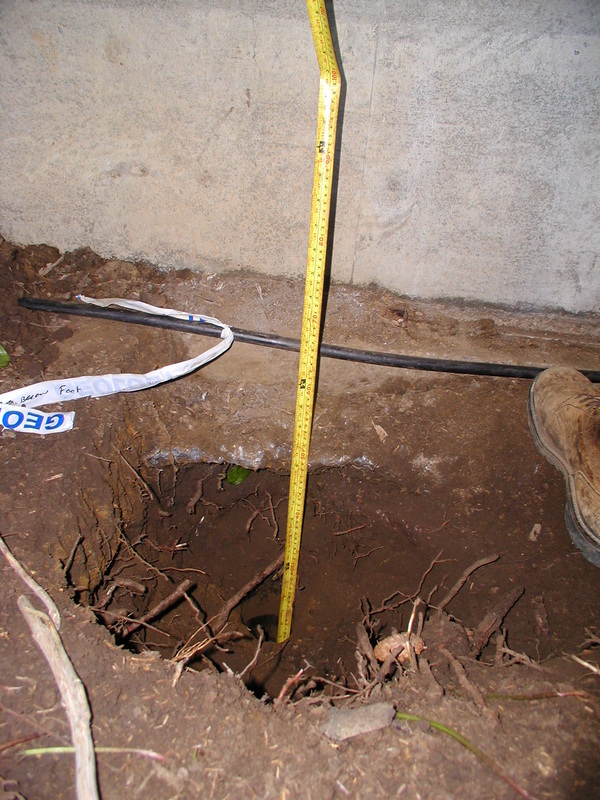 The tape is measuring the depth to what should have been the target foundation-bearing soil, a competent subsoil. We are lucky to work in some beautiful locations. Here are former BGC staff engineering geologists Beau Whitney (foreground) and Bryan Dussell (in shadow) trying hard to ignore the awesome view. ...hired us to first provide field investigations and reports to support the design of foundations for six different towers, and then to inspect the excavations. Whereas some of the towers have a cast-in-place pier many feet deep and many feet in diameter, others sit on a massive block of concrete. 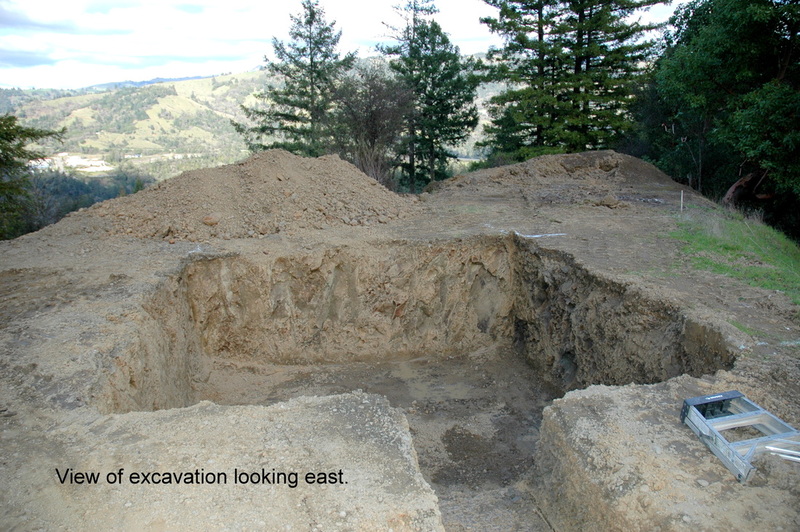 This excavation in Garberville, CA, is for one of the later types of foundation. ...in Harbor, OR, had some legitimate concerns about the workmanship of the deck supports of this some. We determined the soils conditions and stability of the slope and made verbal recommendations. 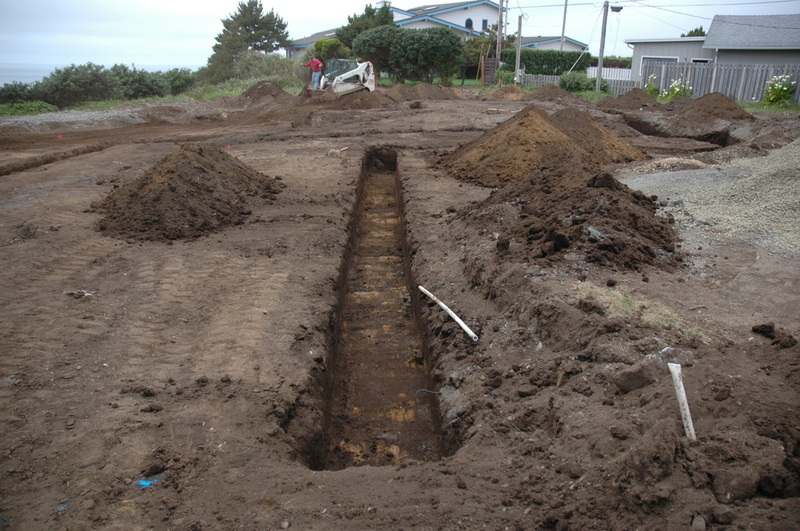 ...did a perfect job preparing this bluff-top site in Brookings, OR, and then digging the foundation excavations. The yellow subsoil is the target bearing soil. 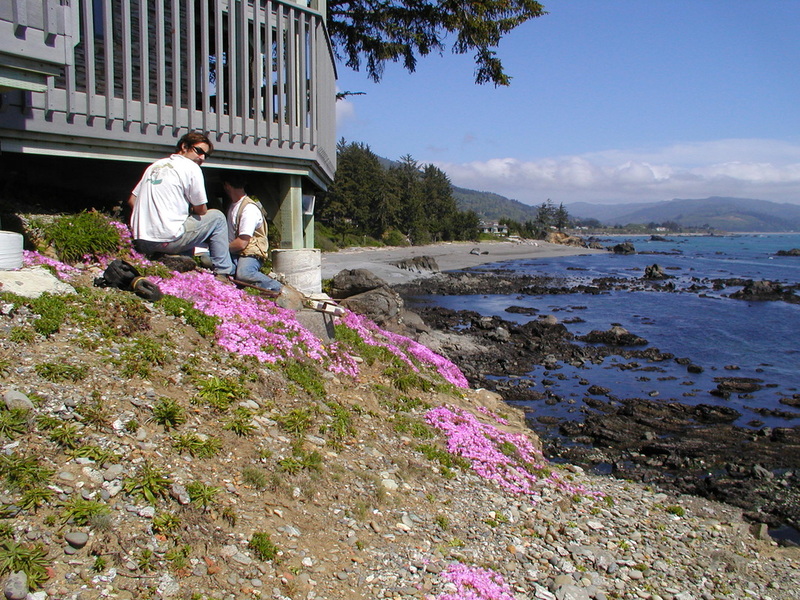 ...of a beautiful home overlooking the Rogue River east of Gold Beach, OR, hired us to inspect the grounds around his hilltop home and then write a report that would provide disclosure to potential buyers. When all was said and done, he decided he didn't want to sell his dream home after all. We couldn't blame him. 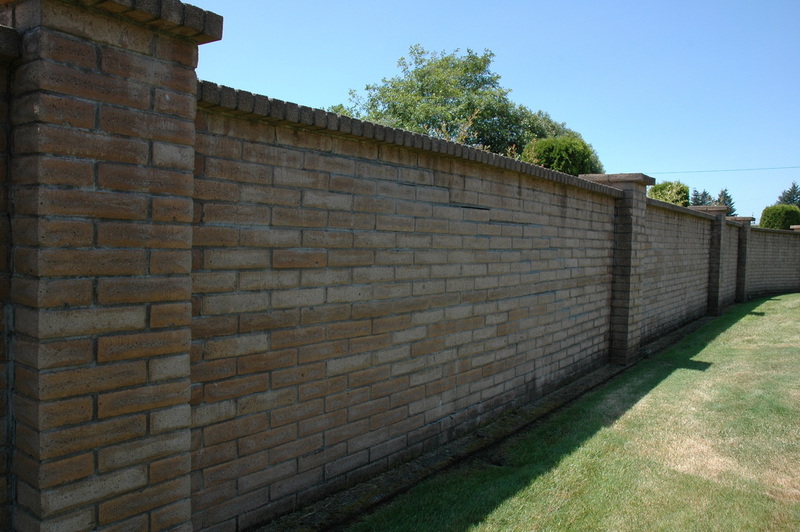 This photo shows a keystone block retaining wall. ...of a gated condominium complex in Brookings, OR, hired us to evaluate the cause of severe settlement of a property wall and the development of sinkholes on the property. Working with an engineer we determined that a large-diameter corrugated metal pipe that carries water from a creek had rusted out and collapsed in places, allowing water to carry the backfill away. The project engineer designed a replacement pipe system, including some slip lining, and we monitored the excavation work for the new line. 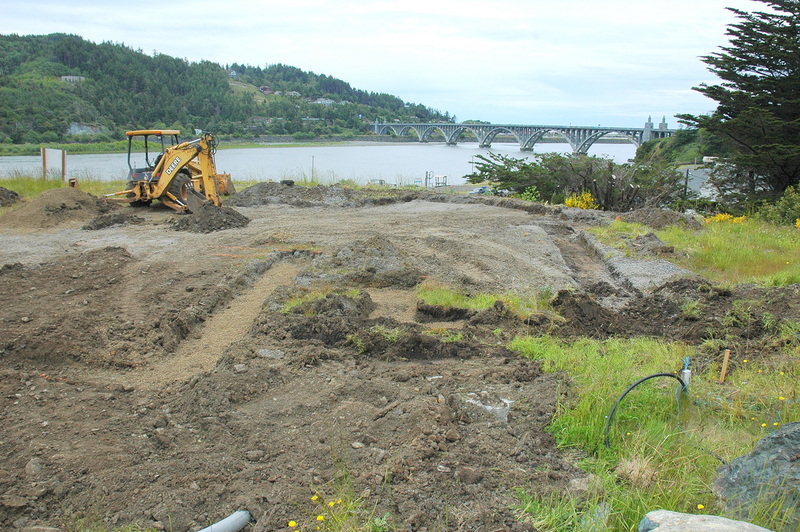 ...of a lot downslope of Mountain View Drive north of Brookings, OR, was the victim of inexperienced earthworks contractors who excavated a long driveway and large building pad into a marginally stable hillslope. The excavation triggered a landslide that progressed upslope, eventually reaching the road. 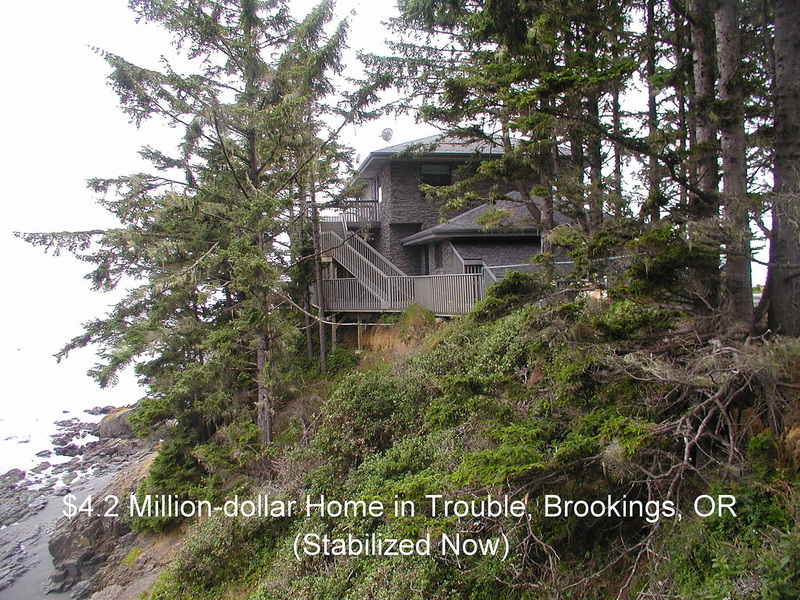 Threatened with litigation by the subdivision's road committee, the buyer had to stabilize the road at his expense. 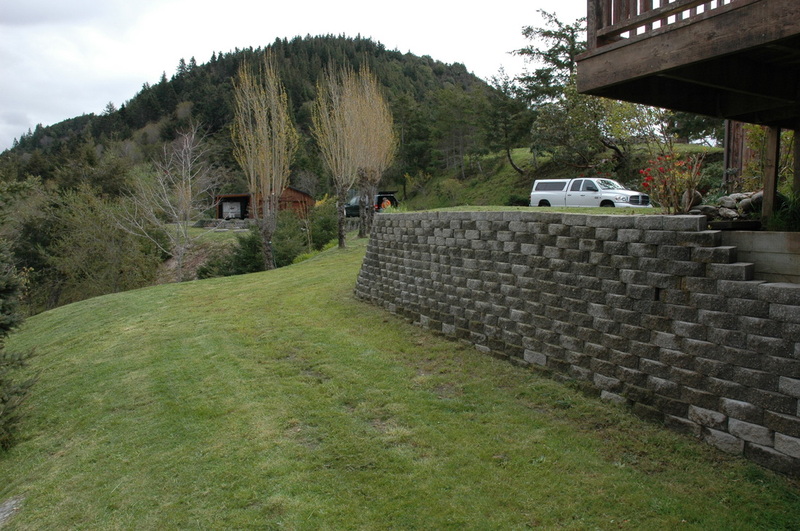 A contractor from Coos Bay, OR, installed a driven soldier pile wall at the downslope edge of the road prism. It worked. Sadly, the lot was a total loss. 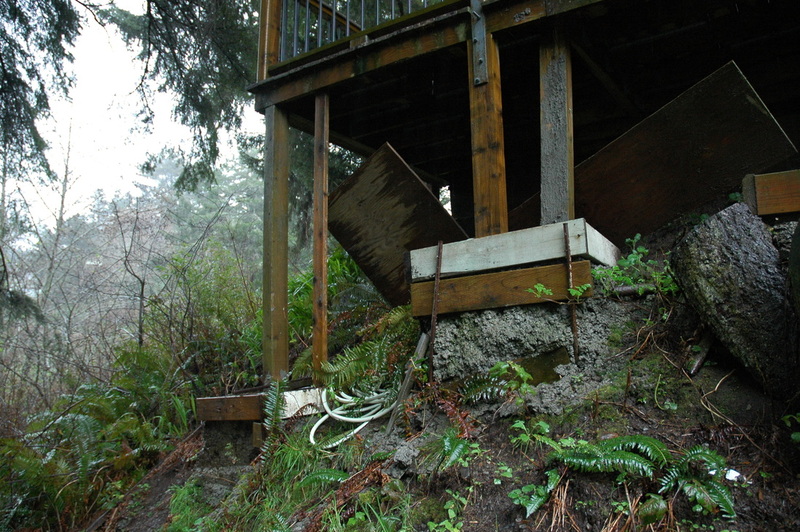 The property, geotechnical investigation (that included monitoring), lawyers, and the retaining wall collectively cost the buyer somewhere around $100,000.